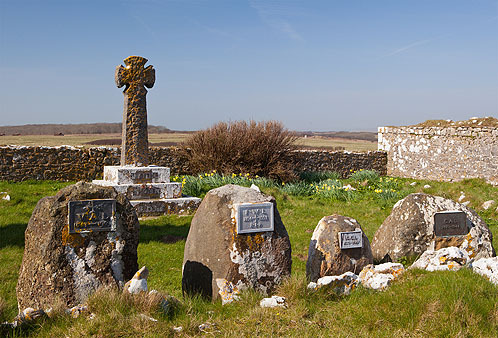 Along with numerous lichen covered and heavily eroded limestone rocks in Flimston Churchyard , are some glacial erratics - collected in the vicinity , some used as memorials for the Lambton family (The last to C.A.L , dated 1871-1946 ). The Erratics have been lifted and moved by Glacial action , from the North of Pembrokeshire and include Dolerite (Mynydd Preseli) and Gabbro (St David's) rocks. The Chapel dates from the 5th Century , restored in 1903 , after being used as a barn / grain store , restored again with help from the German Army in the 1960's.